I love me a good book. But even more than that, I love me a good literary festival featuring some of my favorite authors. 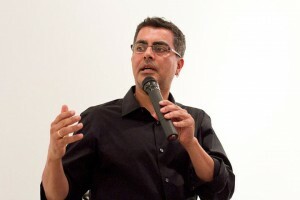 Tonight kicks off Page Starter 2011, the Asian American Literary Festival’s third annual event. The event, which concludes tomorrow, features literary darlings such as Junot Diaz and Teju Cole. And even more exciting for Sepia Mutiny, our very own Amitava Kumar will be honored as the winner of the Asian American Literary award for nonfiction for his book, A Foreigner Carrying in the Crook of His Arm a Tiny Bomb. To celebrate, we turned the tables on this SM blogger and asked him some questions for a change. What surprised you about the response to your last book, A Foreigner Carrying in the Crook of His Arm a Tiny Bomb? That it won a prize? No, actually, now that you ask, let me unburden myself. At the New York launch of the book, an academic friend, very political, a proper hater of the FBI, walked out after I had said something about how exasperating I had found talking to one of my subjects, someone who was convicted of terrorism. Was the man guilty of everything the government had charged? No. Was he a pathetic liar? Yes. Couldn’t both facts coexist? Academics, so many of them, demand such purity! I hate it. As a writer, I want to portray how messed-up the world is. Also, if I could add: As a writer, I am so messed-up, and I don’t want to hide that either. What’s the most risky situation you found yourself in while writing your last book? I got myself into riskier situations when writing Husband of a Fanatic. For example, I was waiting in a market in Lahore to meet a man at midnight–that man was from the same group that a few weeks later would kill Daniel Pearl. Or the day in Ahmedabad when I was ushered into the room to meet the RSS leader who had ordered the killing of Muslims. The man wasn’t threatening but I had lied through my teeth to get there, and I could see I had aroused the suspicions of his handlers. During the writing of A Foreigner Carrying in the Crook of His Arm a Tiny Bomb, my return to Kashmir posed a problem. But it posed the risk only of embarrassment. I was visiting an alcoholic uncle in an army camp. How have you seen your writing evolve since Husband of a Fanatic? No. Oh wait, maybe this is what I want to say: as you get older, your joints become more stiff, but your writing flows better. Life-writing balance. Your advice for young writers? It’s difficult, it’s difficult. That repeated phrase in that preceding sentence is the only odd kind of balance I find in my life these days. Most of my time, or at least most of my energy, seems to go into tending my children. And there are rewards, sure, but better sentences sure isn’t one of them. And yet my advice to young folk is not to say no to life, but to be disciplined. Write every single day, even if it’s only a little. The premise of your next book? A young man comes to the United States and hears Dr .Ruth on the radio. Which modern Asian American writer(s) are you reading at the moment? I’m reading the Chinese writer Yu Hua because of an event that is coming up at Asia Society. Last week, I read Suketu Mehta’s interview with Raj Rajratnam and was singed with envy. The smell of burning flesh lasted for days. Fiction. Because fiction is a demanding mistress, difficult to please, and impossible to give up. To hear Amitava talk about his book this weekend, check out a full schedule of tomorrow’s events. Why: Because reading is fundamental. I would give anything to be in NY tomorrow. Agreed, Ankur! I wish I could go so much! I like what he writes. Hey Amitav, when are you going to write about that guy who came up with that priceless line, “Asi gachi Pakistan, Bata ros ta batanev san” Or have you buried your conscience?